First he rewrote the record book. 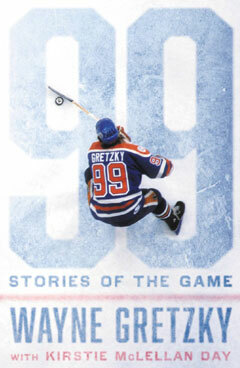 Now, to mark the NHL's 99th anniversary, Wayne Gretzky has written the story of our game. From the moment Wayne Gretzky joined the NHL, as an 18 year old prospect, he changed the game. He led a dynasty of young stars to a level of speed and skill we had never seen before. The result was four Stanley Cups in six years. By the time he hung up his skates 20 years later, he had re-written the record book, and spread hockey’s popularity from California across the USA. We already know what he means to the game. What we haven't seen is what the game means to him. In 99: Stories of the Game, Wayne Gretzky, on the eve of the league’s one hundredth birthday, tells us about the NHL's most memorable moments from his point of view. Wayne shares never-before-published anecdotes about the great players and great characters who have inspired him. From hockey's fierce early battles on natural ice, through its mythical golden era, where Howe, Richard, Beliveau, Hull, Orr and Esposito defined greatness, through the unforgettable dynasties in Montreal, New York and Edmonton, through today’s success stories in Detroit, Chicago, LA and Pittsburgh. Written with the insight of someone who knows the incomparable thrill of lifting the Stanley Cup, as well as the agony of falling short against a bitter rival, Wayne has gathered the best from his memories, victories and defeats, friendships and rivalries. All of them great stories. 99 great Stories of the Game. WAYNE GRETZKY is known around the world simply as "The Great One." He started early, at the age of three, skating hours each day on a backyard rink his dad built for him. By the age of ten, he scored 378 goals in one season. He went on to score more goals, more assists and more points than any other NHL player. He has won Stanley Cups, Canada Cups, and an Olympic Gold Medal. There is simply no bigger name in the game. KIRSTIE MCLELLAN DAY ranks among the top hockey book writers in the world thanks to the four national bestsellers: Theo Fleury’s memoir Playing with Fire, Bob Probert's Tough Guy and Ron MacLean's Cornered and Hockey Towns. Kirstie is a mother of five and is married to television producer Larry Day. Together they own one of Canada's most successful television companies, Pyramid Productions.